new year’s eve was super great & i mean super. i went to my favorites’ house for the night & ended up staying for two. there was disco & tequila & i donned my brown sequins pants & the sky-highest art-deco-y bronze shoes. the day after was a haze of mimosas, tea, the fighter, benedicts, mimosas, bridesmaids, bacon, mimosas, fried potatoes with aioli, inception & lays potato chips. enough said. the day after the day after found b at the blender whipping up smoothies. oh it was a very good start to a the new year. lightly toast bread & place in a 200-degree oven to keep warm. heat 2 to 3 inches salted water to a simmer in a wide saucepan for the eggs; turn off the heat & cover to keep warm. for the hollandaise, combine the egg yolks, lemon juice, water, salt & cayenne in a blender and blend until light and fluffy, about 1 minute. with the blender running, slowly pour in the melted butter. add more salt or lemon juice to taste. return the water in the saucepan to a low simmer. add the vinegar and swirl a couple of times with a kitchen spoon. crack each egg into a cup & then gently drop 4 eggs into the simmering water and cook until just set, 4 to 5 minutes. remove with a slotted spoon to a clean, dry dishtowel. repeat with remaining 4 eggs. place 2 pieces of toast on each plate. put 2 pieces of bacon on each half and top with 1 poached eggs. spoon the warm hollandaise sauce over sprinkle with chopped parsley. 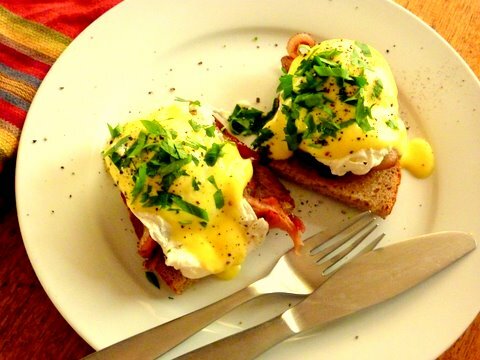 Yum – have never attempted hollandaise but am inspired to now! Uh oh, you KNOW this gets me into trouble! I really should eat before reading. Great start to 2012.